In the mid-16th century, Giuseppe Arcimboldo completed a series of remarkable experiments in parabiosis – the surgical fusion of two or more individuals. Titled, respectively, Air, Earth and Water, each experiment required the suturing of more than twenty animals. The resulting form – a sort of superorganism – contained a single circulatory system, pumped by many hearts. Each arrangement, in addition, was plotted to resemble the profile of a human face (Figure 1). Had Arcimboldo employed only genetically identical organisms – or non-identical members of the same species – his work would still have been very challenging. In reality, however, Arcimboldo performed sutures between many different species. In many cases, these species were only distantly related. In Air, for instance, he sutured a peacock (order: Galliformes) directly to a parrot (order: Psittaciformes) and to an owl (order: Strigiformes) (Figure 1a). In Earth, he sutured an elephant (order: Proboscidea) directly to a boar (order: Artiodactyla), to a donkey (order: Perissodactyla) and to multiple members of the order Carnivora (Figure 1b). In Water, he disregarded species barriers still more blithely, forming surgical unions between vertebrates to invertebrates. He sutured fish to coral; he sutured a turtle to a crustacean and a cephalopod (Figure 1c). The successful integration of these diverse species is a testament to Arcimboldo's skill. Historically, parabiosis – the surgical fusion of two or more individuals – has been plagued by a number of technical challenges. Even if the surgery is performed correctly – non-targeted tissues are not nicked or stabbed, and the stitch-up work is competent – other risks remain. Wounds may become infected. Individual immune systems, alerted to the presence of foreign tissue, may mount destructive attacks. In most of his experiments, Arcimboldo sidestepped these challenges. His superorganisms, expertly plotted, appear to have sustained the health of each member. One telling exception may, however, be evident at the bottom of the experiment Earth. Here, two specimens, a lion and a sheep, seem to have suffered significant withering (Figure 1c). It is common to attribute Arcimboldo's success to his decision to employ two-dimensional animals. This position – understandably – is most vociferously held by surgeons who operate on three-dimensional animals, who have, thus far, been unable to replicate his accomplishments. There is some merit in this position. Two-dimensional systems are, in general, more manageable. Interfaces between animals, restricted along one or two lines, present less opportunity for infection and immune rejection. It has also been alleged – with less justice – that Arcimboldo's work is somehow less relevant than work conducted in three dimensions. This seems an unfair charge. We would not, in comparison, denigrate the work of a biologist operating in a simple, bacteria-based system, simply because he failed to achieve the same using a mouse or human. Using a simpler, two-dimensional system, Arcimboldo laid important groundwork. Through his experiments, he devised solutions to an array of technical problems. His work remains a model – and a challenge – for surgeons attempting work in more complex systems. In the 20th century, another important two-dimensional practitioner, M.C. Escher, further advanced the field. 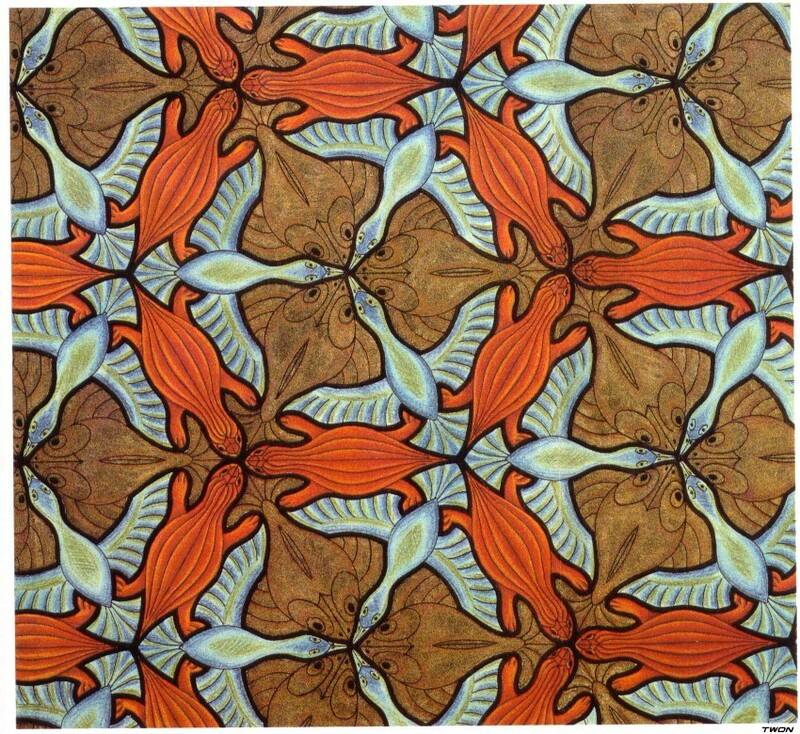 Many of Escher's parabioses consisted of continuous sheets of organisms, arranged according to a regular pattern. 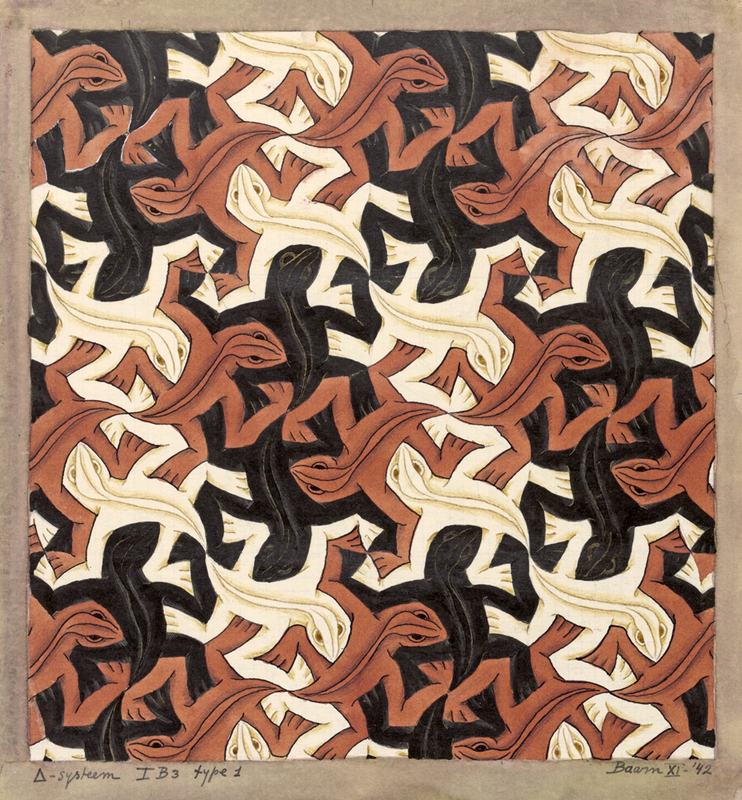 In Lizard, for instance, Escher constructed a superorganism consisting of three varieties of lizard – red, black, and white (Figure 2a). In the central portion of this parabiosis, Escher positioned each lizard such that it shared an extended boundary with four other lizards. Each lizard's head, for instance, was entirely framed by the left side and two left limbs of an adjacent lizard; each lower right hindlimb, similarly, was entirely framed by the right side and two right limbs of an adjacent lizard. Additional sutures, formed between adjacent tail tips or limb tips, established additional, minor boundaries. A salient aspect of Lizard – and of Escher's other experiments – is its regularity. In it, precisely equivalent sets of sutures appear at multiple positions. In this way, Escher rigorously demonstrated the suitability of each suture. Arcimboldo's work, in contrast, appears a bit more haphazard. Each of his sutures, though brilliant, constituted a solution to a very individual problem, never to be quite repeated. One of the most remarkable features of Lizard is its incorporation of fractional animals. Escher constructed this parabiosis as a rectangle; at the perimeter, he cleaved overhanging organisms in order to generate perfect edges. He patched the remaining pieces – some headless, some tailless, some consisting only of a foot – with additional stitches. The viability of these fractional organisms is notable in multiple respects. Escher ensured, first, that each piece remained viable during the primary surgery. Some of these surgeries – head severing, followed by neck resuturing, in particular – are notoriously difficult. 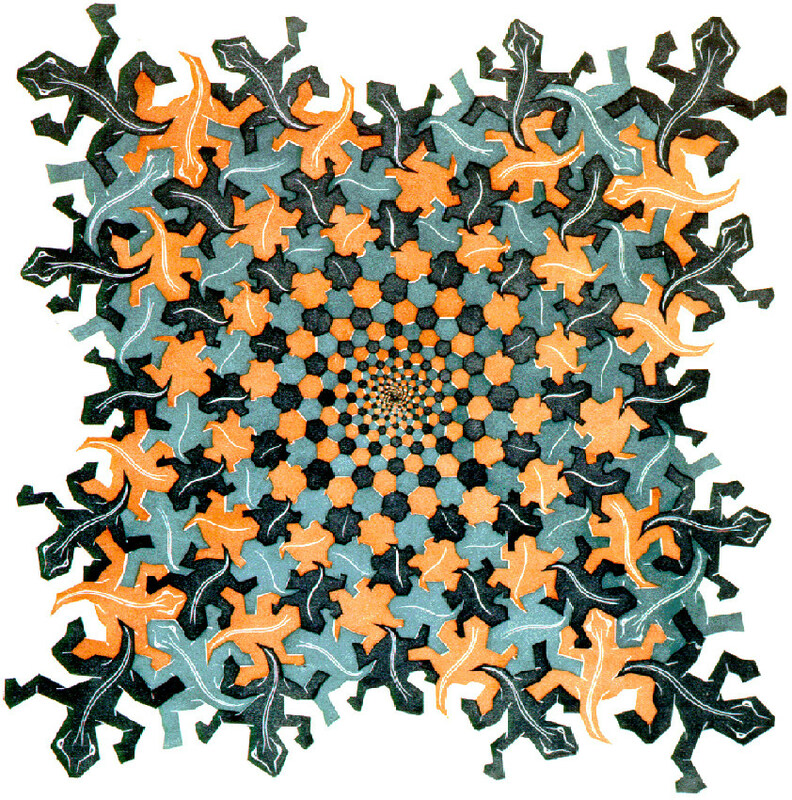 Escher also ensured that these fractional organisms remained viable in the long term. For many of these fractions – those lacking vital organs, in particular – this survival was linked to functions performed by other organisms within the parabiosis. For Escher, one of the most taxing parts of this work would have been to determine the number of functional organs – heart, lung, liver, etc. – required to support a given mass of fractional organisms. Another of Escher's technical innovations is displayed in an experiment titled Development III. In this work, Escher surgically linked lizards at different stages of embryonic development (Figure 2b). On the edges of the parabiosis, he positioned fully mature lizards. In the center, he positioned lizards from much earlier stages, prior to any discernible differentiation. At intermediate positions, linking these two extremes, he sutured a series of intermediate forms. This parabiosis was remarkably stable. Though surgically linked, the various developmental stages remained distinct from one another. Molecules secreted by the more advanced lizards did not – apparently – accelerate the development of the less advanced lizards. It has been conjectured that Escher may have disrupted the transport of such molecules, perhaps through the use of artificial membranes. His notes, however, do not record this. In other parabioses, Escher experimented with the surgical suturing of diverse species. In Symmetry Drawing, for instance, he surgically linked birds, fish, and turtles (Figure 2c). In no experiment, however, did Escher attempt to match the biodiversity of Arcimboldo's parabioses. He worked, instead, to develop a few choice techniques, honed using a smaller number of animals. Arcimboldo, a product of his time, explored the biological world using broad strokes. Escher, a product of a later time, understood the value of the model organism. Arcimboldo and Escher were both important experimentalists. Each pushed surgical practice to new extremes. Each set new standards for parabiosis, demonstrating new and remarkable ways in which multiple animals might be persuaded to share a common circulatory system. At the same time, their experiments also earned them a certain public following. Non-scientists have long been drawn by these parabioses, viewing them as a kind of art. These constructs, with their unnatural jumble of heads and limbs and blood, remain, for many, singularly evocative. Challenging traditional boundaries – the distinction, fundamental, between one organism and a second – they have provoked a variety of assessments. How strange! their admirers have cried. And: How beautiful. Rachel Rodman lives in North Carolina. Her work has been published in Sein und Werden, PANK, and The Human Genre Project.